Tobias Dennerlein, Sebastian Hafenbrädl, Johannes Müller-Trede, Sampsa Samila, Sanja Tumbas, and David Wehrheim. 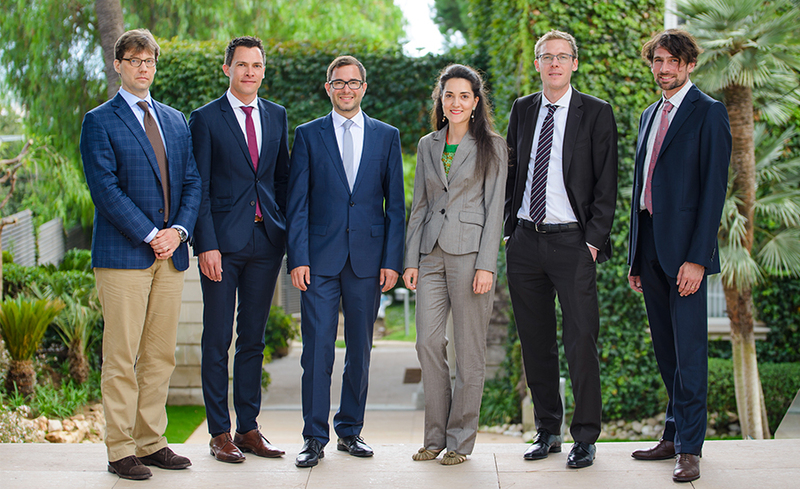 These are the names of the six professors who have recently joined IESE, raising the total faculty to 114 professors of 22 different nationalities. Tobias Dennerlein (Germany) has joined the Managing People in Organizations Department as a Postdoctoral Fellow. He received a joint doctorate in Management (Organizational Behavior) from Rotterdam School of Management and HEC Lausanne.Dennerlein´s research interests revolve around leader behavior (e.g. empowering leadership, narcissistic leadership, leader justice) and employee motivation and behavioral outcomes (such as creativity and performance) across levels of analysis. He uses both experimental and cross-sectional methods to answer his research questions. Sebastian Hafenbradl (Germany) has joined IESE as an Assistant Professor in the Managing People in Organizations Department. He completed his postdoctoral research at the School of Management, Yale University, and the Faculty of Business and Economics (HEC), University of Lausanne. He received his PhD in Management from HEC Lausanne. He also holds a diploma from the TUM School of Management, Technical University of Munich.Hafenbradl´s research on judgment and decision-making lies at the intersection of psychology and economics. In particular, he focuses on managerial contexts, ethics, and the role played by social and institutional forces. Johannes Müller-Trede has joined the faculty as an Assistant Professor in the Managerial Decision Sciences Department. He holds a PhD in Economics from Universitat Pompeu Fabra in Barcelona. After graduation, he spent several years working as a post-doctoral researcher in the Rady School of Management at the University of California, San Diego.Müller-Trede is interested in the performance, psychology, and rationality of people’s decision-making. In recent work, he has studied how people can learn from others about their own preferences, and how leveraging a variety of individual learning experiences can improve team decisions. His research has been published in leading management and psychology journals such as Management Science and the Journal of Behavioral Decision Making. Sampsa Samila (Finland) has been incorporated into the Strategic Management Department as an Assistant Professor. He received his PhD from Columbia University and his MSc from Helsinki University of Technology (now part of Aalto University). Samila has taught previously at Columbia Business School, Brock University, and the National University of Singapore.His research focuses primarily on economic geography, innovation, entrepreneurship, and social capital. He has studied how venture capital, labor laws, and government research funding affect regional economic growth. Samila is currently engaged in studies of the performance of yields on venture capital, gender and ethnic integration, trust and networks, returns to sustained brokerage in networks, and co-authorship networks in science. His work has been published in journals such as American Sociological Review, Management Science, Research Policy, and the Review of Economics and Statistics. Sanja Tumbas (Hungary) has joined the faculty as an Assistant Professor in the Information Systems Department. She completed her doctorate in Business Economics at the Institute of Information Systems at the University of Liechtenstein. She also holds an MSc in Information Systems from the University of Münster in Germany.Tumbas´s research focuses on two broad themes: digital entrepreneurship and digital innovation in established organizations. More specifically, her dissertation project explored the role of digital technologies during rapid growth in young entrepreneurial organizations. Also, in the past few years she engaged in studies with large organizations and interviewed executives who drive digital innovation initiatives. David Wehrheim (Germany) is also among the new faculty members. He is an Assistant Professor in the Strategic Management Department. He holds a PhD in Business and Finance from Universidad Carlos III de Madrid, a Master of Science in Business and Quantitative Methods from the same university, and an undergraduate degree from Technical University of Munich.Wehrheim´s research uses large-scale empirical approaches to study innovation at the firm and individual level. In particular, his current interests include the design and management of technology-based strategic alliances, feedback effects from financial markets to corporate R&D decisions, as well as the role of patent rights for the mobility of knowledge workers and the creation of start-ups. In its support to the faculty in generating and disseminating new knowledge, the activity of the Research Division has continued to grow. During the 2016-2017 academic year, three new chairs were created – the SEAT Chair of Innovation; the Joaquim Molins Figueras Chair of Strategic Alliances and the Novartis Chair on Operational Excellence in the Health Sector; and 19 books, 102 cases and almost 70 academic articles were published. In addition, the IESE Insight knowledge portal averaged nearly 60,000 page views per month. Furthermore, the 78 events, seminars and conferences organized by the research division were attended by nearly 5,000 participants.